Spring stop for foot return. 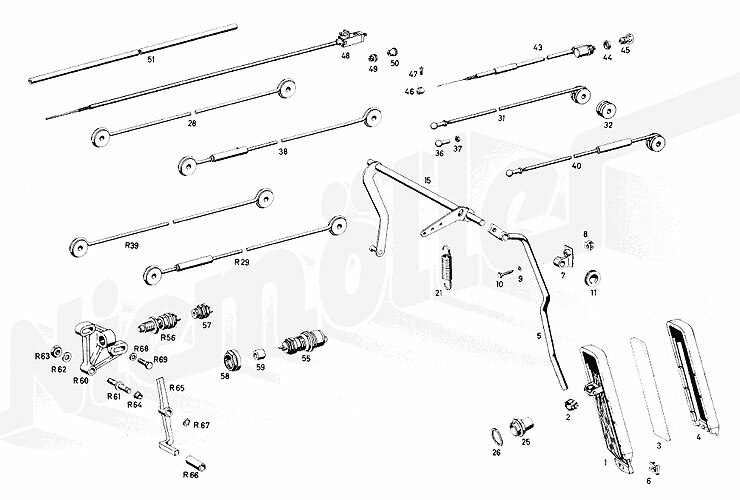 5 F 30 001 levers a.A. a.A.
0 F 30 003 LeverR.L. a.A. a.A.
15 F 30 012 Shaft a.A. a.A.
0 F 30 017 Shaft R.L. a.A. a.A.
40 F 30 043 rod a.A. a.A.
43 D 30 157 wire drawing a.A. a.A.
55 D 30 118 Spring stop, L.L. a.A. a.A.
R56 D 30 122 Spring stop for foot return. a.A. a.A.
57 D 30 124 kick down switch a.A. a.A.
59 F 30 061 rubber buffer a.A. a.A.
R60 F 30 062 Clevis foot R.L. a.A. a.A.
R61 F 30 063 Screw R.L. a.A. a.A.
R65 F 30 064 Lever R.L. a.A. a.A.
R66 F 30 065 R.L. hose a.A. a.A.
R67 C 07 359 Lock washer f. bell cranks a.A. a.A.